The Field Trainer 400S provides all the benefits of the Field Trainer 400, with the addition of higher stimulation levels for larger or stubborn dogs. 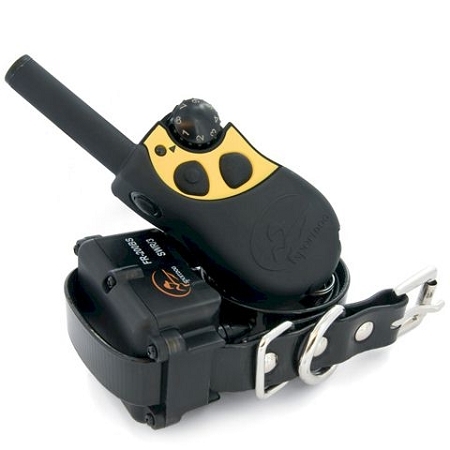 The Field Trainer 400 series of electronic remote training collars from SportDOG is loaded with technical breakthroughs in the smallest package available in this price range. Features such as 3-dog expandability and waterproof/submersible transmitters and receivers are among the most advanced benefits ever offered in a mid-range remote training system. With 400 yards of range, these palm-of-the-hand sized models are designed for field training and hunting with close-working dogs. The SportDOG Field Trainer Shock Collar for Stubborn Dogs is an incredibly versatile dog training collar and a good choice for all-around use. This remote trainer is the first of its kind bringing features from the higher end of the remote collar price range. The SportDOG Field Trainer Shock Collar for Stubborn Dogs is an effective and affordable trainer with a 400 yard range featuring a 2.8 oz receiver collar ideal for any dog over 30 pounds or sporting and hunting breeds. The SD-400S is for hard-to-train dogs. Plus it's rechargeable! The SportDOG Field Trainer Shock Collar for Stubborn Dogs is ideal for training in the yard, field, or for hunting with close-working dogs. Both the transmitter and receiver are waterproof and submersible. You can customize your SportDOG Field Trainer Shock Collar for Stubborn Dogs to match your training preference. It comes set up in MODE-1 (an 8-level continuous + 8-level momentary stimulation one dog collar with a non-stimulation tone button), but it can easily be changed into 7 different modes with different button configurations. This allows you to customize your transmitter to your training needs.